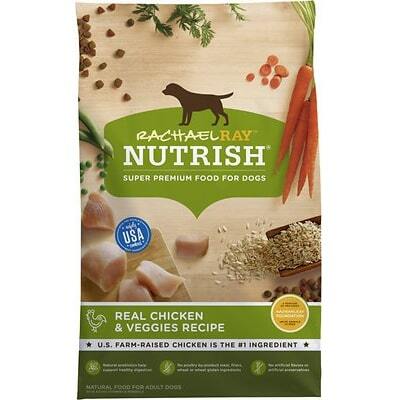 Rachael Ray Nutrish Just 6 is a low-priced dog food with good quality. This product has no controversial ingredients, including zero artificial preservatives, colors or flavors. It has a high amount of carbs, compared to its protein and fat, but the quality of the meat and fat is excellent. 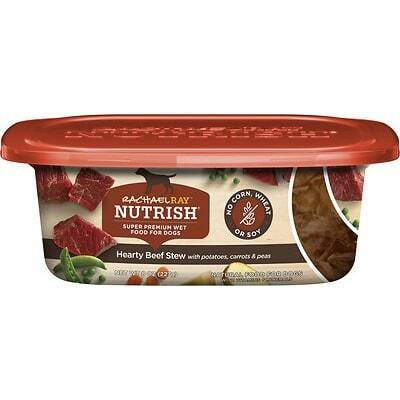 Rachael Ray Nutrish has a below-average number of recalls and was not very transparent when answering our questions. The food is in high carbs and low protein and fats, making it less nutritionally balanced compared to other dog foods we evaluated. Carbohydrates are cheap so they keep the food’s cost low and they are nutritionally useful to dogs in the right amounts. However, very high amounts of carbs can reduce the much-needed meat-based protein and fat content. 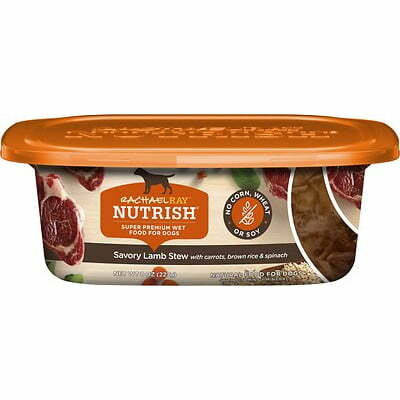 Lamb Meal, Brown Rice, Ground Rice, Dried Plain Beet Pulp, Chicken Fat (preserved with Mixed Tocopherols), Natural Pork Flavor, Sodium Chloride, Potassium Chloride, Zinc Proteinate, Vitamin E Supplement, Iron Proteinate, L-Ascorbyl-2-Polyphosphate (Source of Vitamin C), Choline Chloride, Copper Proteinate, Manganese Proteinate, Biotin, Niacin, d-Calcium Pantothenate, Sodium Selenite, Vitamin A Supplement, Riboflavin Supplement, Thiamine Mononitrate, Vitamin B12 Supplement, Calcium Iodate, Pyridoxine Hydrochloride (Source of Vitamin B6), Vitamin D3 Supplement, Folic Acid. The average dog food we reviewed has 39 total ingredients, with 1 controversial ingredient. This product has 0 controversial ingredients, excellent! Lamb is generally a healthy dog food ingredient. Meat meals are the result of cooking. Water is removed from meats to create a protein-rich meal powder. Meat meals contain about four times the protein meats do, so generally, they're a good source of nutrients. Rice provides calories, complex carbohydrates and a few other nutrients to dogs. We generally consider it a quality dog food ingredient. Beet pulp is a by-product from the processing of sugar beet. It's a somewhat controversial ingredient that some claim is a high-sugar ingredient that could potentially lead to hyperactivity and allergies - while others claim positive effects on blood sugar and intestinal health. More studies need to be conducted but a moderate amount of dried beet pulp is likely acceptable. Chicken fat is the fat left over after cooking chicken parts. It's a high-quality dog food ingredient that provides nutrients such as fat and Omega-6 fatty acids. Mixed-Tocopherols are a natural preservative made from Vitamin E that helps keep food fresh. We consider it a high-quality dog food preservative. 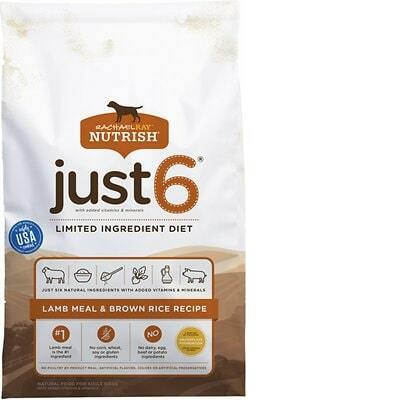 Rachael Ray Nutrish Just 6 Natural Lamb Meal & Brown Rice Limited Ingredient Recipe doesn’t have any controversial ingredients. Rachael Ray Nutrish Just 6 is made in the USA. This is very good, because of the high-quality standards for dog food manufacturing in the United States. 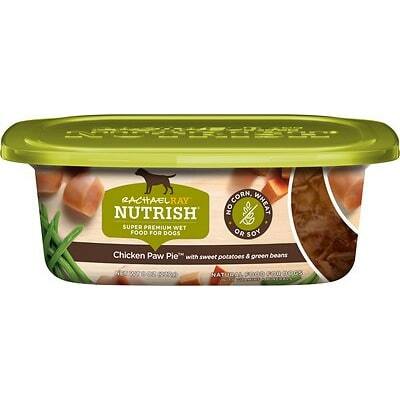 Lamb Meal and Chicken Fat are the meat and added fat in this dog food. Both are very transparent ingredients, which clearly show which animals they are sourced from. Excellent! Rachael Ray Nutrish has a below-average number of food recalls.